Aylesbury driver Trevor Willis was the clear winner in both rounds of the Midland Hill Climb Championship at Shelsley Walsh on 6th May. Driving his V8 powered OMS 25, Trevor recorded times of 24.16 and 23.85 with two scintillating drives – taking less that two seconds for the first 64 feet and reaching the Bottom Ess at a speed of 130mph – beating Derek Young with his 4-litre Gould GR51 into second place, followed by Will Hall in the new V6 Force in third place, on both runs. Several ‘new faces’ also made the run-offs, with current ladies hill record hold Sue Young joining her husband to qualify in their shared Gould, with Lyn Owen, wife of car constructor Steve Owen, also making the run-off in their OMS 25, as did Howard Savage-Jones in his beautifully sculptured Lola V8. Will Hall of Halesowen, had mixed fortunes in his V6 Force, having to make a trip to constructor Ian Dayson at Rugeley for emergency repairs to the rear of the car on Saturday evening, before ably proving the potential of the new car in timed competition on Sunday. Simon Fidoe of Fernhill Heath faired less well, having to retire his 1,000cc Empire racing car after suspension failure on Sunday morning. The new spectator platform created over the winter months at Kennel Bend proved very popular throughout the weekend, giving visitors a splendid new view of the wide variety of sports, saloons and racing cars leaving the start line. Guests for the weekend included a small number of drivers of the British Women Racing Drivers’ Club, which is celebrating its 50th anniversary this year. 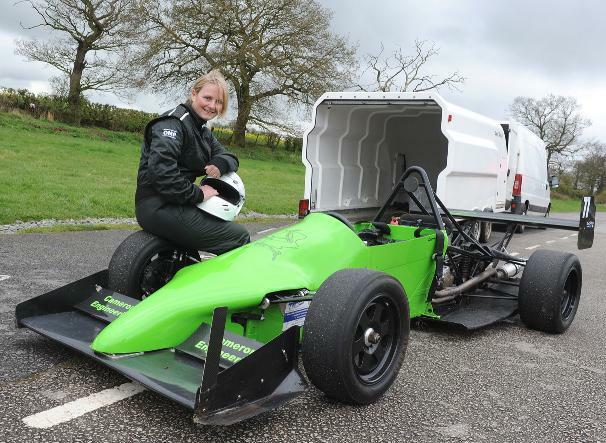 Debut driver Tracey Cameron, from Malvern, overcame early nerves in her 600cc Honda powered Nemisis racing car to hit her target of beating 40 seconds at Shelsley Walsh, and did so by managing a 39 seconds run in practice and then a superb run of 35 seconds on Sunday. The Paul Matty Sports Cars Lotus Championship was well supported with over 20 cars from 1960s racers up to modern day Elise variants taking part and their ‘boisterous’ prizegiving ceremony was taking place in fine humour on the terrace in the late afternoon sunshine, while the other competitors were packing up after a very successful weekend. The next meeting at Shelsley Walsh is a round of The British Hill Climb Championship on the 2nd and 3rd of June. The highlight of the weekend will be the BRM celebrations with the P25 that won BRM’s first World Championship Grand Prix at Zandvoort in 1959, Richard Attwood’s P261, and the BRM FF built by Roy Lane already confirmed. Notable BRM personnel will also be present throughout the weekend with BRM designer Tony Southgate and Team Manager Tim Parnell. Fourteen year old rally driver Alexander Vassallo took a dominant win at last weekend’s DCC Junior Stages rally, his third consecutive victory in his debut season. 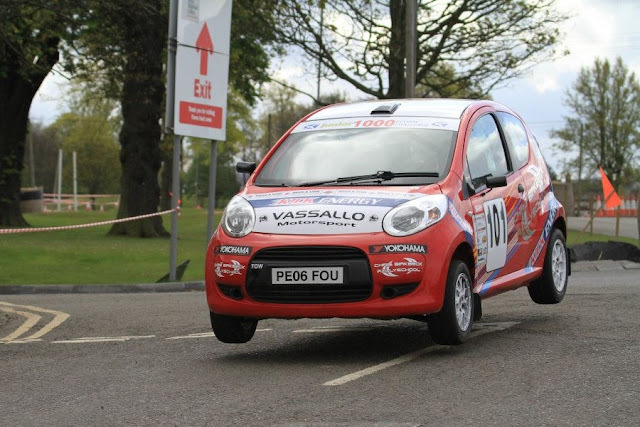 Vassallo, from Corbridge, is contesting both the Junior 1000 Rally Challenge and Junior 1000 Ecosse Challenge championships this year, both championships are for drivers aged between 14 and 17 using cars with engines of 1000cc or less. Despite only starting rallying this year Vassallo had already won two of the three events he had contested prior to the DCC Stages so hopes were high of a good result at the Ingliston-based second round of the Ecosse Challenge. With experienced co-driver Janice Moore in his Birkbeck-prepared Citroën C1 Vassallo made a storming start to the event, setting a time 28 seconds faster than his nearest rival. He continued that form throughout the days eight stages, being quickest on each one despite the tyres going off on stage 4 and a small overshoot on stage 5. By the end of the event he had pulled out a lead of almost three minutes, a remarkable performance when Junior 1000 events are more usually settled by a few seconds. Vassallo’s Ecosse Challenge season will continue with the Summer Stages at Crail in June while the next Junior 1000 Rally Challenge round is the TSH Stages at Portreath on 18/19 May. 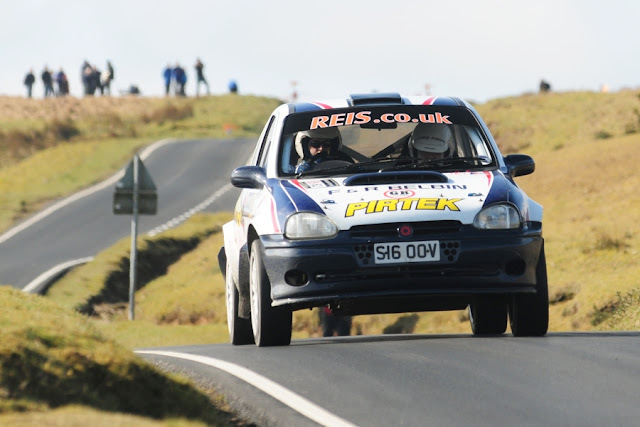 Kev Monaghan in action on the Tour of Epynt, before the problems that cost him a finish. Kev Monaghan is aiming to get his rally season back on track next weekend when he contests round 2 of the MSA Asphalt Rally Championship, the Manx National rally. After retiring from the opening championship round in March Monaghan needs a good finish on the Manx to kick start his championship campaign. With usual co-driver Chris Purvis out injured after an accident at work Monaghan will have David Jones on the pacenotes in the Pirtek-backed Vauxhall Corsa Kit Car. “Having competed for more years than I care to remember I cannot wait to rally on the Isle of Man, it is a venue that I have always wanted to compete at,” said Monaghan. The front hubs have been strengthened on the Corsa following problems on the last event and an additional front engine mount has been added to cope with the paddle shift gearbox. The rally starts on Friday evening (11th May) before continuing with a full day of action on Saturday. Competitors will face 120 miles of stages all held on the island’s closed public roads. The Rally2Raise project, which is using motorsport to raise funds and awareness for charitable causes, recently passed the £1,500 mark in donations. The project was set up in late 2011 by Rachel Medich to support the Nystagmus Network, the MS Society, Cancer Research UK and the Joanne Bingley Memorial Foundation for post-natal depression. As well as undertaking fundraising activities Rachel and her friend Katherine Begg have been promoting all four causes through participating in motorsport events in their DMACK Tyres and Clark Motorsport-supported Rally2Raise Nissan Micra rally car. Nystagmus Network development manager John Sanders said: "We are so grateful to Rachel and Katherine for all that they are doing to raise both funds and awareness through their rally driving. At around one in 1,000, nystagmus is more common than most people think - you've almost certainly met someone with nystagmus for instance. One of the challenges we face is getting that message across, and that's where Rally2Raise is making a big difference." 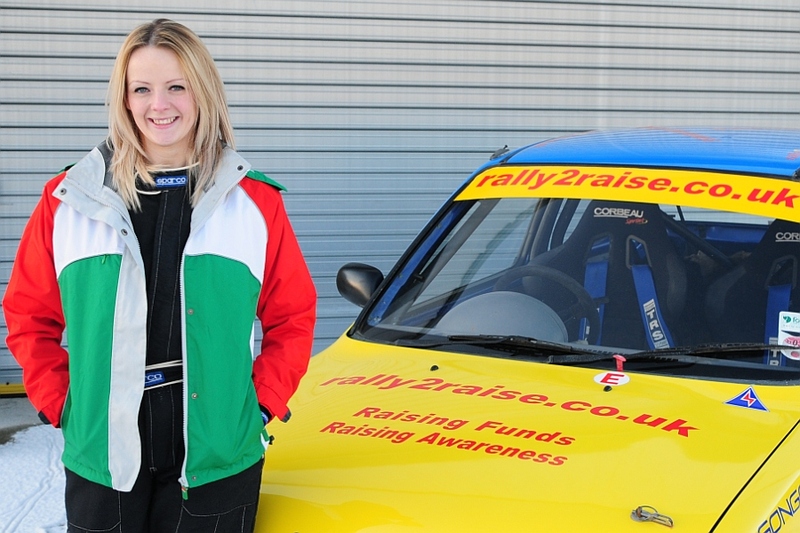 Rachel is hoping to contest the Dumfries-based Scottish rally in June and she has already agreed to take part in the Merrick stages in September after the rally organisers made Rally2Raise their nominated charitable cause for 2012. For more information on the project please visit www.rally2raise.co.uk or www.facebook.com/rally2raise. 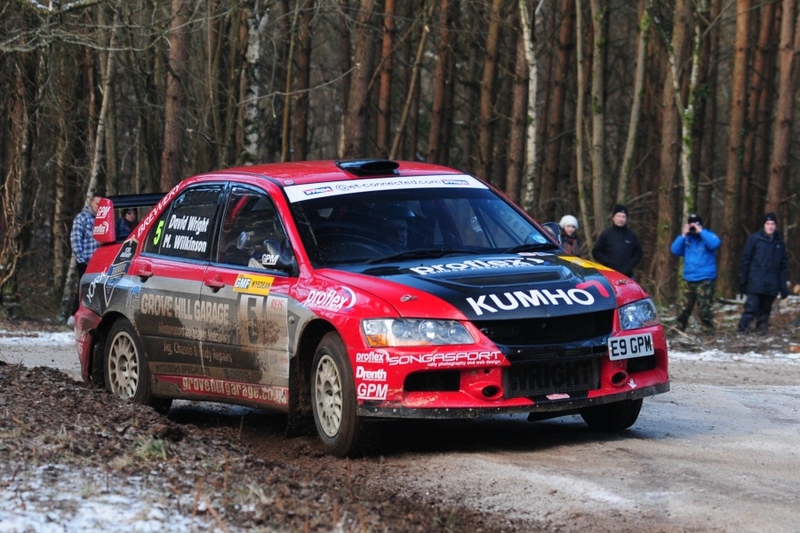 Online donations can be made via http://uk.virginmoneygiving.com/rally2raise. The opening programme in the dedicated television coverage of the 2012 Porsche Carrera Cup GB will be broadcast in the Motorsport UK programme on Tuesday 8 May on ITV4, on ITV1 on the night of Sunday 13 May and will also be shown on ITV4 on Saturday 12 May. The Motorsport UK series, which features hour-long programmes, will cover all of the Carrera Cup GB action this season. Action from round two on the opening weekend of the season at Brands Hatch will feature in this programme. 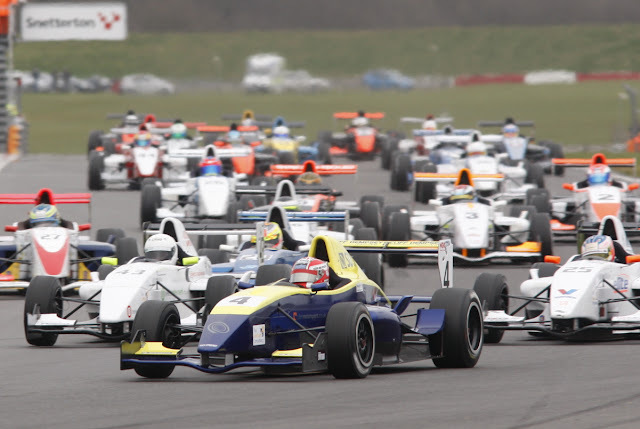 Viewing figures from Motorsport UK in 2011 showed a typical total programme audience of between 300,000 and 500.000 viewers. Motorsport UK can also be watched at itv.com and is available for viewing for 30 days after the initial broadcast date. Rally driver Richard Sykes had a disappointing Pirelli Challenge rally last weekend when a mystery electrical problem caused him to retire from the event. 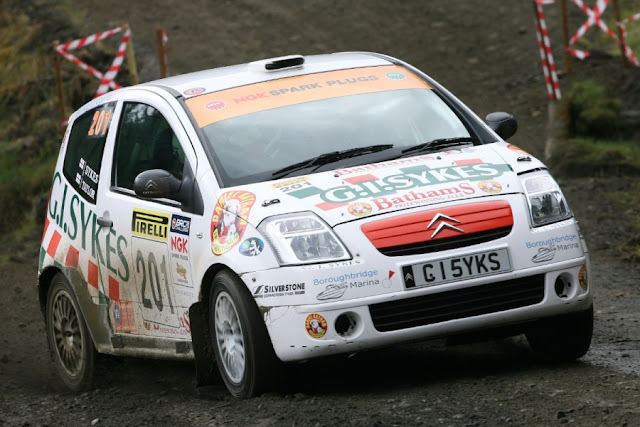 The Carlisle-based event was round 3 of the BRC Challenge championship and after excellent performances in his Bathams Brewery, G I Sykes Ltd, Boroughbridge Marina and Silverstone Tyres-supported Citroën C2 R2 Max on the opening two rounds Sykes went into the event at the head of the championship leaderboard. The rally started well and going into the third stage Sykes was just six seconds behind rally leader Simon Moore despite not pushing hard as his target for the event was a podium finish rather than a win. Part way through the third stage the car suffered an electrical problem which meant it had very little power as the engine would not rev above 1500rpm. Sykes and co-driver Simon Taylor carried on through the stage hoping to nurse the car to the end but there was a steep hill near the finish and the car did not have enough power to get up it. Despite frantic attempts to repair the car the event was over for the Stourbridge driver. Sykes’ next event will be the Jim Clark Challenge rally which takes place at the start of June. 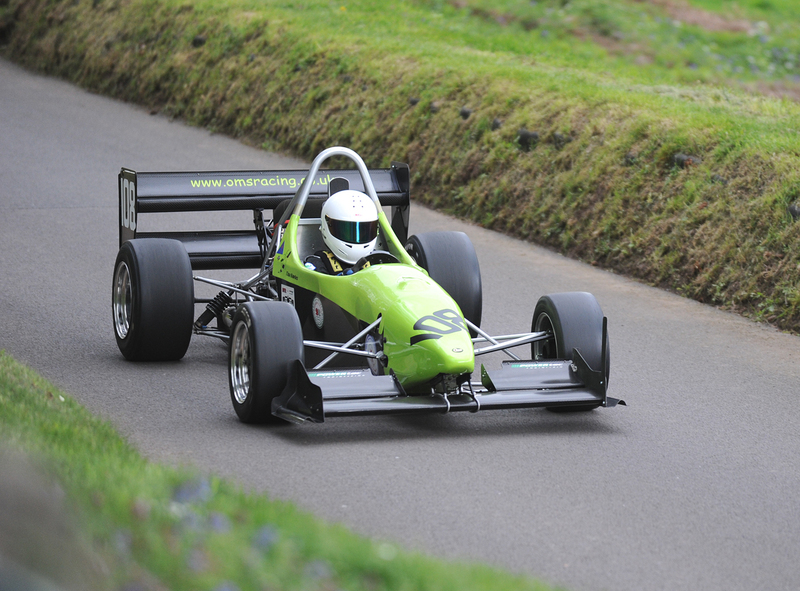 This weekend sees the first speed hill climb meeting of the year taking place at Shelsley Walsh, near Worcester, and it has attracted a full house of top drivers and their cars from across the UK. 2012 sees the 50th anniversary of British Women Racing Drivers Club, formed in 1962 to promote and support women in all forms of motorsport, and they have recently proudly announced that young Scottish member Susie Wolff has been appointed as a development driver for the Williams F1 Team. Two championship contenders entered with a new car this weekend are father and son, Charles and James Williams, of Claverley, near Wolverhampton, who are competing in a Force PC racing car. 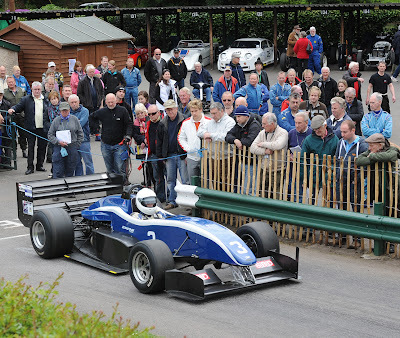 Shelsley Walsh will be hosting a special class for competitors from the BWRDC this weekend, and other clubs invited to attend including, ‘Flat Head’ historic cars, Aston Martin, and entrants in the Paul Matty Sports Cars Lotus Championship. The event is a round of the TTC Group Midland Hill Climb Championship and attracts a wide variety of competition classes for saloon, sports and racing cars, with the action starting at 9.30am each day. Practice and qualifying takes place on Saturday, with timed competition runs on Sunday, together with a separate ‘run off’ for the twelve fastest championship contenders, which takes place after the morning session and at the end of the afternoon competition runs. 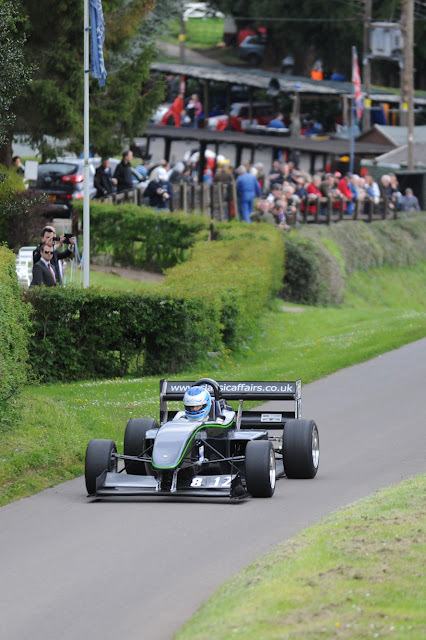 Shelsley Walsh is run by the Midland Automobile Club which enjoys the sponsorship of Midlands prestige car dealerships Stratstone, who provide course cars for each event and Brightwells Auctioneers and Valuers of Leominster, one of the oldest salerooms in the country. British Rally Championship star Matt Cotton banished the memories of his 2008 crash when he finished a creditable 13th overall and 2nd in class on last weekend’s Pirelli International Rally. Partnered by co-driver Glyn Thomas, the rapid Cornishman from St Teath endured a hard fought battle with AVS Motorsport team mate Gethin Jones throughout the 96 competitive stage miles in Cumbria to lose out on a win by a scant 8.1 seconds at the finish. Some of the world’s top drivers converged on Carlisle City Centre to kick off the event on Friday night as the International competitors headed towards the first 2 stages of the event which would be held under the cover of darkness. Crews would face a tough test within the ‘killer’ Kielder Forest complex - so called due to its notorious roads, deep ditches and unforgiving nature, meaning there would be no room for error without a substantial penalty. Having finished second best on the first two rounds of the series so far, Cotton was conscious that a ‘flat out’ approach to the event would be the only course of action if he was to stay in with a chance to fight for championship honours. Taking the first stage win on Friday night was an important boost to his confidence as he dropped behind rival Jones on the second loop to ensure he was behind him on the road for the Saturday contest. “I’m pleased with our speed straight out of the box tonight” said Matt as he headed to the overnight halt. “We set some good times even though my style was a little too sideways for these stages. I’ll need to settle into a tidier rhythm tomorrow”. The first stage on Saturday would prove to be the decider for the event as Cotton lost 17 seconds on the slippery Bewshaugh stage and would now need to push as hard as possible if he was to regain the lead by the time the crews headed back to Carlisle Racecourse for the finish ceremony. Responding to the deficit, Cotton set about trying to overhaul Jones and taking many stage wins throughout the remaining competitive miles. But despite his best efforts, the South West pairing crossed the finish ramp in second place by just 8.1 seconds. “It’s been an amazing battle all day long and we were trading times with Gethin throughout the event” said Glyn at the finish. 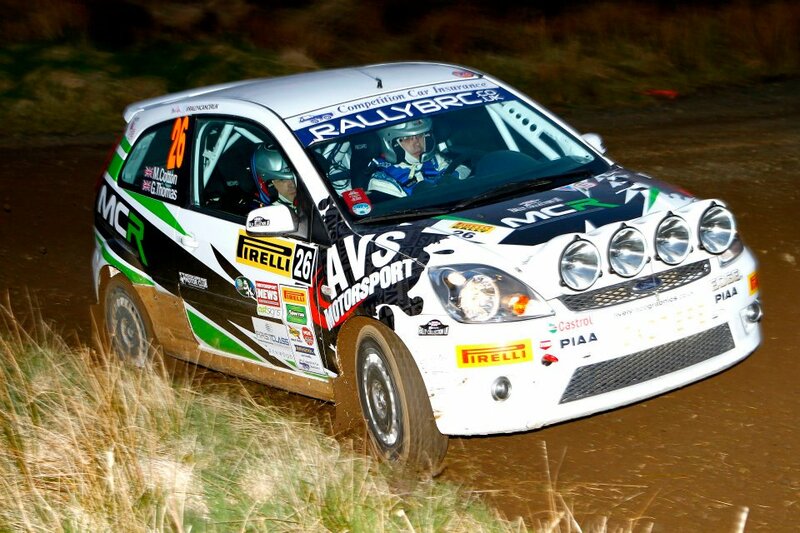 I’m really pleased by our performance this weekend especially considering Matt ended this rally in 2008 upside down in a ditch! It’s clear to see we have improved on every event this season and are looking forward to the sealed surface of the Jim Clark Rally in a few weeks time”. This encouraging finish boosts Matt and Glyn to 3rd overall in the Fiesta Sporting Trophy which is run by the Ford World Rally Championship organisation, M-Sport. This result is even more worthy as other contenders in the series pilot the far more powerful R2 category cars. They also lie in 14th place in the British Rally Championship and 2nd in class 8. 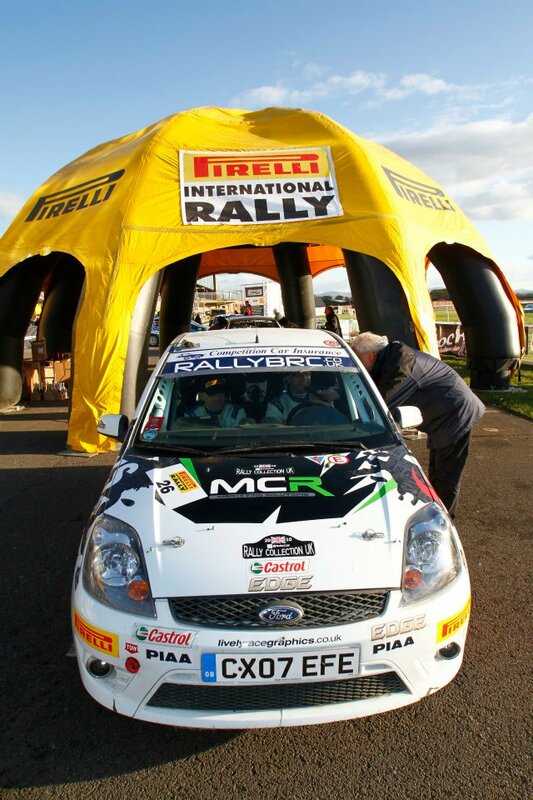 The Jim Clark International Rally is the next round on the calendar and takes crews to the first tarmac round of the series on 1st – 3rd June in the Scottish Border towns of Kelso and Duns.